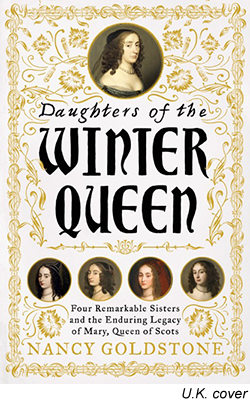 From the great courts, glittering palaces, and war-ravaged battlefields of seventeenth-century Europe comes the riveting story of four unforgettable sisters and their glamorous mother, Elizabeth Stuart, granddaughter of the martyred Mary, queen of Scots. Assailed by danger, scandal, and intrigue, pursued by powerful enemies, this pivotal family of spirited, passionate women, by steadfastly refusing to surrender to adversity, survived to change the course of history. Elizabeth Stuart’s life was transformed at the age of six when her godmother, the storied Queen Elizabeth I, died and her father, James Stuart, ascended to the throne of England. From a life of genteel poverty in unruly Scotland, vivacious Elizabeth, graceful, tall and slender, the image of her grandmother Mary right down to the tumbling auburn curls, was suddenly thrust into the fairy tale existence of a princess of illustrious England, surrounded by wealth and splendor. When her father married Elizabeth at sixteen to Frederick V, elector of the Palatinate, a German count far below her rank, it was with the understanding that James would help her husband achieve the kingship of Bohemia. Her father’s terrible betrayal of this commitment would ruin “The Winter Queen,” as Elizabeth would forever be known, imperil the lives of those she loved, and launch a war that would last for thirty years. Forced into exile, the Winter Queen and her growing family eventually found refuge in vibrant, tolerant Holland. There, the glorious art and rich intellectual ambience of the Golden Age of the Dutch formed the backdrop to her daughters’ education and indelibly shaped their lives. Highly intelligent and renowned as a scholar during a period when women were all but excluded from serious study, her eldest daughter and namesake, Princess Elizabeth, counted the preeminent philosopher René Descartes and the maverick Quaker William Penn among her closest friends; Louise Hollandine, the free-spirited second sister, whose engaging manner and appealing looks would provoke heartache and scandal, was a student of the celebrated master Gerrit van Honthorst and a gifted painter in her own right. The Winter Queen’s third daughter, shy, gentle Henrietta Maria, the acknowledged beauty of the family, would be the only sister to achieve the dynastic ambition of marrying into royalty, although at a great cost. But it would be the youngest, Sophia, a heroine in the tradition of a Jane Austen novel, whose ready wit and good-natured common sense masked immense strength of character, who would be the one to fulfill the promise of her great-grandmother, a legacy that endures to this day in the lineage of the current royal family of Great Britain. Published by Little, Brown in the U.S. and Weidenfeld & Nicolson in the U.K.
—Miranda Seymour, The New York Times Book Review, June 3, 2018. —Gerard DeGroot, The Times of London, March 31, 2018. —Mine Dinshaw, The Oldie, June 1, 2018. —Neil J. Young, The East Hampton Star, April 5, 2018. —Alan Massie, The Scotsman, April 28, 2018. —All About History Magazine, May 1, 2018. I have wanted to write about Elizabeth Stuart, the Winter Queen, ever since I first stumbled across her story some time ago. But I waited to do her in order. I knew I needed to write first about other queens who came earlier so that I would have the knowledge and scholarship to better understand Elizabeth's life and put her into context. For over a decade I have been examining the lives of important but overlooked women who wielded power in the late Middle Ages and the Renaissance and I have discovered that it is an enormous advantage to come at a subject slowly from the past, to know what the people of the period knew, to look at the world the way they did. I began in the 13th century with Four Queens, about the four daughters of the count of Provence who all became queens—of France, England, Germany, and Sicily, respectively. Each sister's story was so compelling, and the family as a whole was so clearly integral to the politics of the time that it occurred to me that there must be other forgotten women of incredible courage in later centuries, women whose lives were so filled with danger, adventure, and romance that novels and cable television series paled in comparison. So with each book I moved forward in time and in this way found Joanna I, fourteenth century queen of Naples, Jerusalem, and Sicily (The Lady Queen); Yolande of Aragon, queen of Sicily, the woman responsible for discovering and bringing Joan of Arc to the court of the dauphin in the 15th century (The Maid and the Queen); and the Renaissance sovereigns Catherine de' Medici and her youngest daughter Marguerite de Valois (The Rival Queens). When it came to the seventeenth century, Elizabeth Stuart, generally credited with starting the Thirty Years' War, literally leapt off the page at me. The drama of her life! The ups and downs, the narrow escapes! It was like a wild ride from start to finish. There were nights when I was reading ambassadors' reports about her and the war where even though I had already read until my eyes hurt, I simply could not put down the material to go to bed. But what really surprised me was how important Elizabeth's daughters were, not simply to the century in which they lived but to our own, because it is from these women that the current British royal family are descended. So I realized that to tell the full story, to really understand the consequences of Elizabeth I's climactic execution of her cousin, Mary, queen of Scots (as well as the 17th century in all of its gorgeous complexity), I had to include them as well, and I'm very glad I did because it made the history so much richer. Each sister's life was as chock-full of passion, intrigue, and adventure as their mother's, and in the case of Sophia in particular, there was the added boon of a courtship right out of Jane Austen, her elder brother's hilariously dysfunctional marriage, and even, at the end, a true crime murder mystery! For a writer interested in bringing history to life it just doesn't get better than that. Wait, what do you mean this family influenced the succession of Great Britain? Yes, it is one of the great historical ironies that it is through this line, the female line, beginning with Mary, queen of Scots, through Mary's granddaughter, Elizabeth Stuart, the Winter Queen, and then through Elizabeth Stuart's youngest daughter, Sophia, that the present royal family of Great Britain, right down to the child who will be born to the duke and duchess of Cambridge in March 2018, owe their position. Most people believe that George I inherited England, Scotland, and Ireland, and that it was his descendants who have succeeded in an unbroken line to the present day. But that is misleading. George I did NOT inherit Great Britain, his mother, Sophia, did. And it was not a passive inheritance. In one of the most deft political maneuvers I have ever encountered, Sophia went out and negotiated for the crown, leapfrogging over by some estimates as many as fifty other candidates with claims as good as, or in many cases far better than hers. If Queen Anne had died in May 1714 instead of August, Queen Sophia would have ascended to the English throne. George I just inherited it from her—that was the passive inheritance. If it had been up to him, some other family would be occupying Buckingham Palace right now. So this is a book about the British succession? No, no, it's about so much more than that, that's only one dimension! 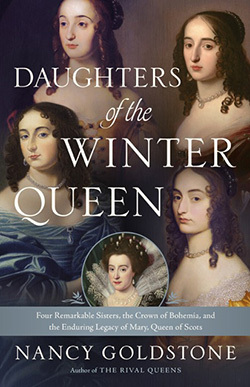 The Winter Queen and her daughters were involved in almost every major development of the period—everything from war, politics, espionage, and diplomacy to philosophy, mathematics, religion, and especially art—learning about the art of the Golden Age of the Dutch was my favorite part of the book. I had a chance to talk to curators at the Metropolitan Museum of Art in NYC and the Museum of Fine Arts in Boston and to track down paintings through the Old Masters divisions of Sotheby's and Christie's. I even had help from the Courtauld Institute in London and Hoogsteder & Hoogsteder in the Netherlands. It was a fabulous journey. For those lucky enough to be able to travel to England or Holland, the best collections of portraits of Elizabeth Stuart and her family are at Ashdown House in Berkshire Downs and at the Hoogsteder gallery at The Hague. Are any of the paintings from the book located in the U.S.? Yes! "The Triumph of the Winter Queen" by Gerrit van Honthorst (the Winter Queen's court painter) is at the Museum of Fine Arts in Boston. You can see it online but I recommend a visit; they've just restored it. Anyone who reads Daughters of the Winter Queen will understand exactly what that allegorical painting is about; for me, going to see it is like visiting old friends. And my favorite portrait of Elizabeth Stuart is actually part of the permanent collection at the Met in NY but I've only seen it once because it's such a jewel that it usually hangs in the curator's office! It's called "Princess Elizabeth, later Queen of Bohemia," and it's by Robert Peake the Elder. You can see that online too but perhaps they will bring it out and exhibit it to the public again some time soon. There's something of a story behind that painting by Robert Peake the Elder at the Met. The catalogue currently states that it is a likeness of Elizabeth Stuart when she was ten years old. But I believe that to be incorrect. It is far more likely that this was her wedding portrait. First, because eyewitness accounts of her nuptial attire match this painting perfectly; she was described as wearing "a gowne of white satin, richly embroidered… upon her head a crown of refined gold, made Imperial by the pearls and diamond thereupon placed, which were so thick beset that they stood like shining pinnacles upon her amber-coloured hair." Another report confirmed that her hair was woven with "rich stones and diamonds; and withal, many diamonds of inestimable value, embroidered upon her sleeves, which even dazzled and amazed the eyes of the beholders." But second, and perhaps even more than the description of her gown and hair, is the clue offered by the book that Elizabeth clutches in her hand in the painting. It is a gift from her mother, Queen Anne, and is inscribed: Not for thy breast, thy Christian mother gives her daughter what jewel fits her best/ A book not big but yet therein some hidden virtue is, and give you endless bliss. Queen Anne had wanted her daughter to marry the powerful King of Spain and become a great queen but Elizabeth, a Protestant, would have had to convert to Catholicism to do this, and the conversion would have been unpopular in Protestant England. So Elizabeth was instead married to a German count far below her rank even though it meant giving up her royal status. Her father, James I, who considered women to be inferior anyway, did not mind his daughter marrying so far beneath her (he never would have allowed it for one of his sons), particularly as it saved him money on her dowry, but her mother was understandably upset that her daughter was throwing away her royal standing and any prospect for an illustrious match and so fought the marriage almost until the day of the ceremony. Thus to the inscription in the book: this gift from her mother is clearly a religious work, possibly a book of psalms, appropriate to her lower married status as a Protestant "Goodwife" [what Queen Anne sneeringly called the wives of German counts] and not a splendid jewel, as she would have had if she had agreed to convert and wed the King of Spain. It seems to me like a parting shot—here's your wedding gift, sorry, no jewel for you, as I would have given you if you'd married as I advised! No one gives the woman marrying the King of Spain a book. In any event, it is highly unlikely that this portrait was painted in 1607 when Elizabeth was ten years old. She lived apart from her parents as a girl and only joined them on special occasions. Her uncle the king of Denmark did make a state visit that year but Queen Anne had just lost a child and the court was in mourning, it is difficult to believe her daughter would be dressed so opulently during this period of grief, and so exactly as she was six years later when she was married. Besides the art, is there anything else about these women that is special? Oh my, yes, just about everything about these women is special! Two of the sisters were philosophers, the highest level of education that could be achieved during the period. Without Princess Elizabeth, for example, Descartes's books would not have found nearly as large an audience, particularly in Germany. She made it her life's work to propagate his theories wherever she went, and it was as a result of her efforts that later Gottfried Wilhelm Leibniz, co-inventor of calculus, came into contact with Descartes's ideas while at the University of Leipsic. It was the first time he had ever been introduced to the study of logic and he immediately switched his major from history to mathematics. The chapters on Princess Elizabeth's relationship with Descartes are one of my favorite parts of Daughters of the Winter Queen. They are filled with humor, scandals, and pathos but more important, they show a side of Descartes—a very human side—that you don't ordinarily find in a history book. And this book is not just about or for women. There are romantic heroes like Prince Rupert and the Marquis of Montrose, and a true crime love triangle that reads exactly like what Anna Karenina would have looked like if Tolstoy had decided to write it as a murder mystery. And, of course, there are also the highly dramatic events leading up to the Thirty Years' War (which by the way will be having its 400th anniversary in 2018). I've never had so much fun writing a book. So many venues—England, France (did I mention that Louis XIV, the Sun King, plays a prominent role in the narrative? ), Germany, Holland—so much action, so much thrilling adventure! I think the Marquis of Montrose summed up the prevailing ethos of the 17th century best: "He either fears his fate too much/ Or his deserts are small/ That dares not put it to the touch/ To gain or lose it all."